In November, 1896, a strange airship was sighted over Sacramento, California. A brightly lit object was observed in the sky by hundreds of people. One witness described the object as cigar-shaped with side wheels like a river boat, and that two men riding a bicycle-like contraption beneath the fuselage could be heard shouting instructions to each other. The sighting took place during the 1890s Yellow Press era, and newspapers across the country picked up the story (and other new sightings), adding non-factual embellishments and creating a sensation or scare. "The numerous reports that come from the west of the appearance of a huge airship, which it is claimed has been seen at various points, may, or may not, be well founded. But there is nothing inherently improbable in them. Trained scientific men, who speak from well-grounded knowledge, have admitted, for a number of years, that aerial navigation is a possibility; and it has long been thought that the practical difficulties in the way of effecting it would soon be overcome. It would not be at all surprising if those practical difficulties had now in reality been solved. 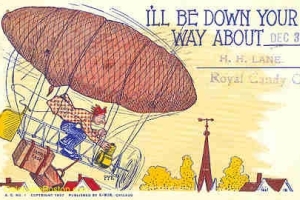 At any rate, if the air ship is not an actual consummation we may expect its appearance at any time. The 19th century has been an era of unparalleled invention. If the air ship shall be invented and perfected before the close of the century it will furnish a memorable climax to an era that is already without parallel." Amazingly, one day later on April 17, 1897, the Aurora Texas UFO "crash" took place. This crash was the "Roswell" of the 1890s. An airship traveling at 10 mph slowly descended over the town square in Aurora, Texas, and crashed into a windmill and exploded. The pilot and sole occupant of the aircraft was killed, and buried in a local cemetery. It was conjectured that this airship was from planet Mars. The Aurora UFO crash was most likely a hoax, as this small town had recently been bypassed by the railroad, and the community was in a morbid state over that circumstance and seeking publicity. "The appearance of an air ship passing swiftly over the peninsula of Hailfax has created much interest. The man who saw the balloon is Charles W. West, consulting engineer. It first appeared immediately above Dartmouth, and he watched it until it disappeared from view. Much speculation has arisen as to the identity of this air ship, which was of an immense size and peculiar shape. Many people, naturally enough, thought it was Herr Andree, the darling aeronaut. While Andree should have long ago reported himself to civilization, It may be that the balloon which passed over Halifax was the Norwegian's, but it is not possible that it contained the explorer alive. The balloon passed over the city about 12.45 o'clock Tuesday afternoon. It was distinctly observed by Mr. West, who had just left his house. Looking upward he saw a strange object flying in the air, which at first he thought a flock of ducks or geese. He watched it for some time, and as it came nearer and became more distinct he saw that it was a balloon of peculiar shape and construction. It appeared to be in the shape of a cylinder, with rounded ends, with another body suspended from it. It was of immense size and flew on an incline in the air. Mr. West says it was flying twice as high up as an ordinary balloon and moved so rapidly in 20 minutes it had passed beyond the range of the naked eye. It passed over the city in a nearly southwesterly direction. Mr. West is an expert engineer, a skillful inventor and a man who is not apt to speak without authority for his remarks. Besides, he has himself experimented in balloon sailing and is thoroughly familiar with the construction and appearance of balloons. The balloon was observed by another man, but his name could not be ascertained." One can describe the UFO Scare of 1897 as mass hysteria, with innumerable brightly lit airships appearing (and disappearing) in the sky. The airplane was invented in 1903, and expectations (and apprehensions) were soon made true about the invention of powered human flight.